Wichelt Imports, 28 count, color Amber. 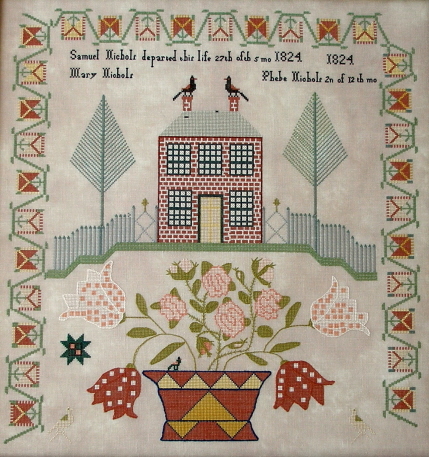 AVAS Soie d’ Alger silks, or DMC cotton. 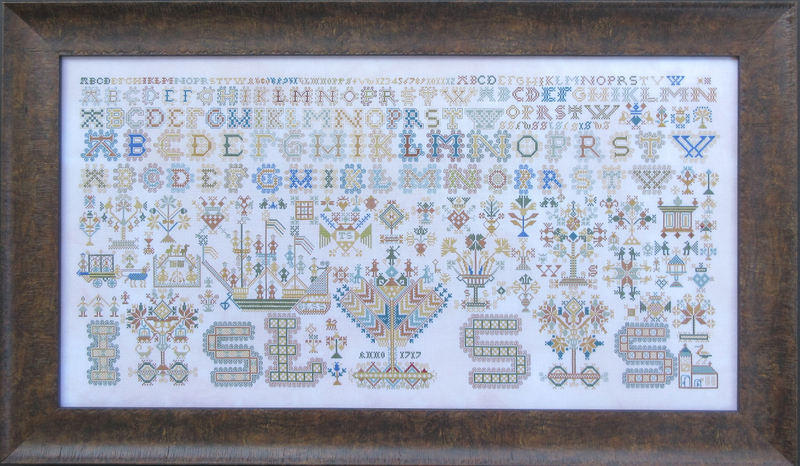 A beginning to intermediate level sampler lover should enjoy finishing this piece. 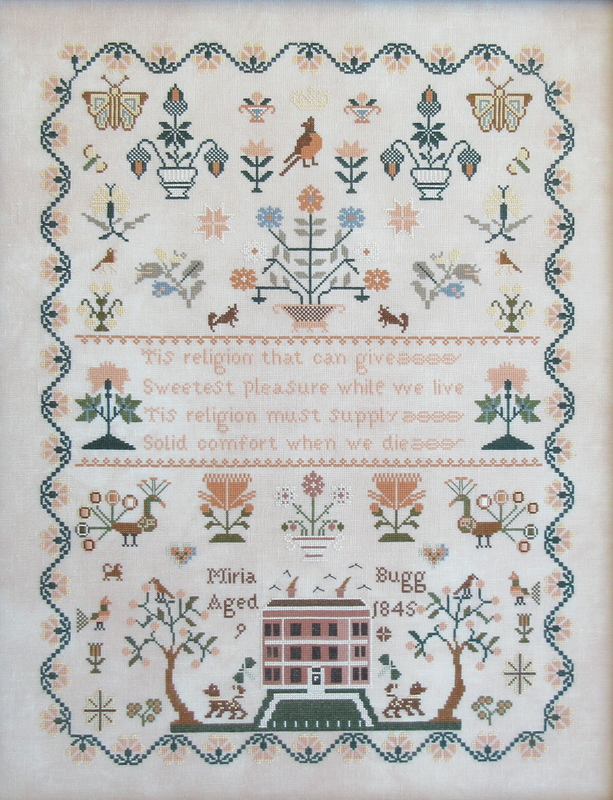 from the Queenstown Sampler Design Collection. 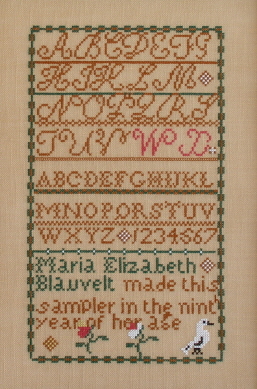 A beginning level sampler lover should enjoy finishing this piece. stitcher's family in Annapolis, MD. 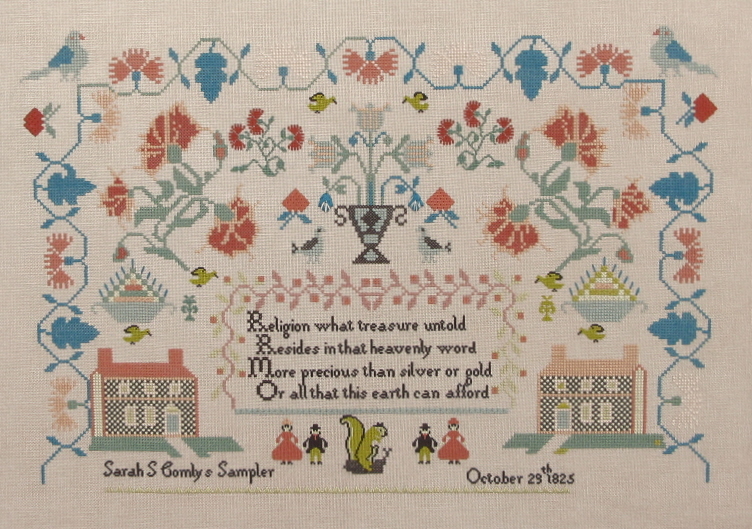 This is the first Annapolis sampler ever reproduced. 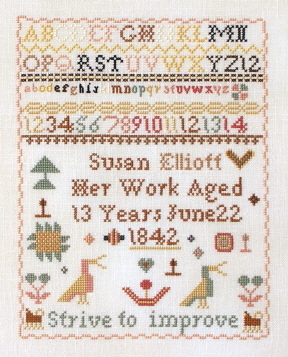 An Advanced level sampler lover should enjoy finishing this piece. An accurate reproduction from the Maryland Historical Society, Baltimore, MD Collection. Lakeside Linens, Stitcher’s half 28 count, color “Examplar”. An experienced level sampler lover should enjoy finishing this piece. Wichelt Imports Inc. Linen 32 count, color Belfast Antique Ivory. AVAS Soie d’ Alger silks from Access Commodities, or DMC cotton. Design area: 15.13” high x 17” wide. 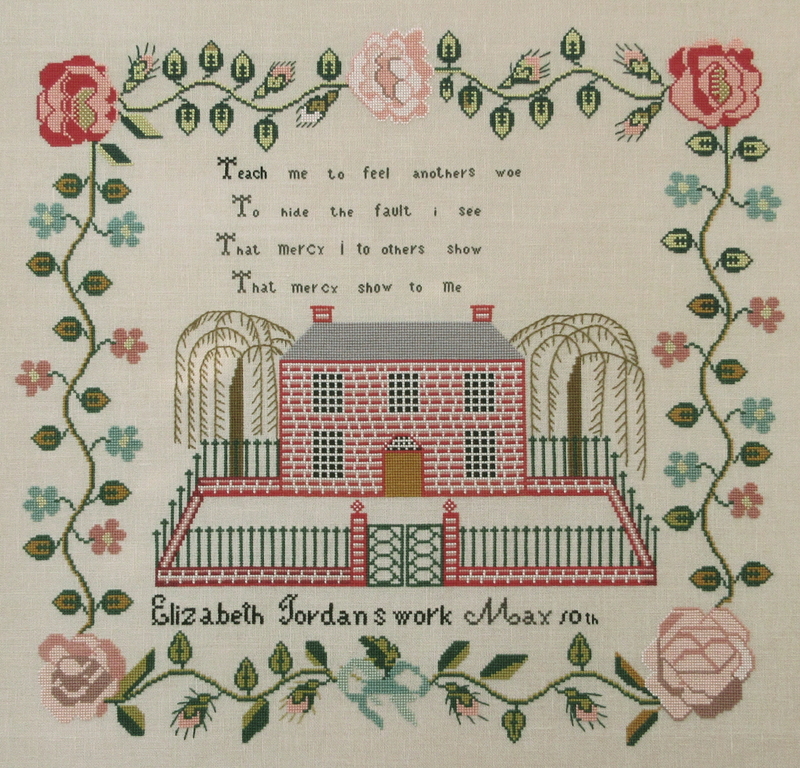 An accurate reproduction of an English sampler held in a private collection. Queen Anne's County Historical Society collection. 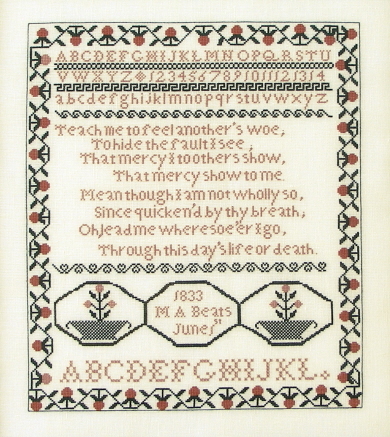 An accurate reproduction of a New England sampler held in the QSD Collection. Lakeside Linens, stitcher's half, 36 count, Vintage Fawn. 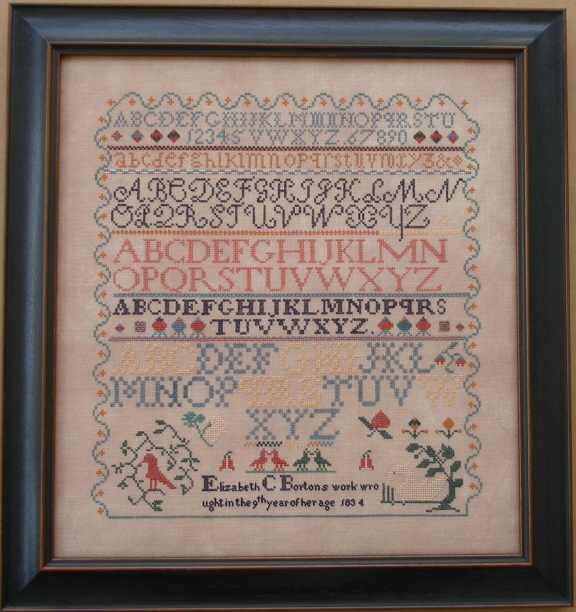 A true Reproduction French sampler from the QSD collection. Belfast linen, 32 count. Color Platinum. 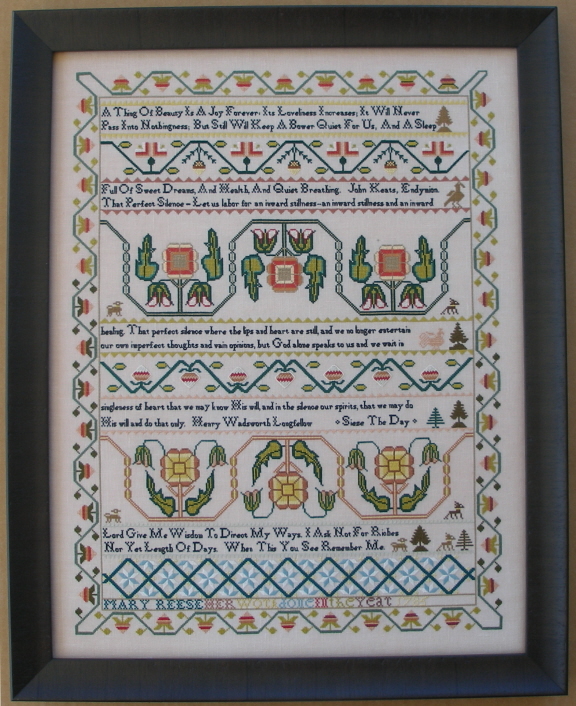 A true reproduction, Virginia sampler from the Winchester Frederick County Historical Society collection. 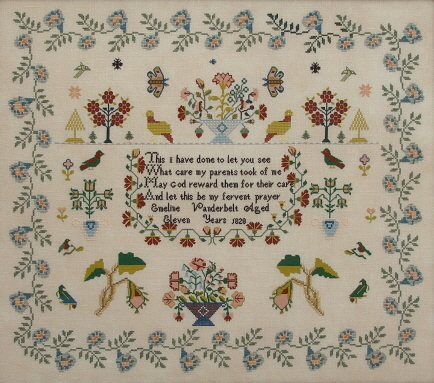 A true reproduction, English sampler from a private collection. 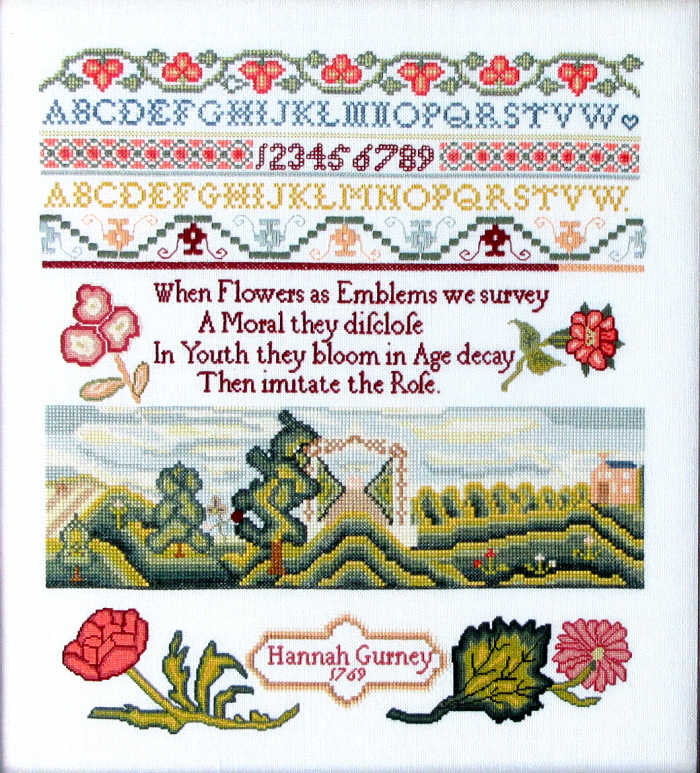 An Experienced sampler lover should enjoy finishing this piece. Lakeside Linens, 40 Count Graziano, Color porcelain. 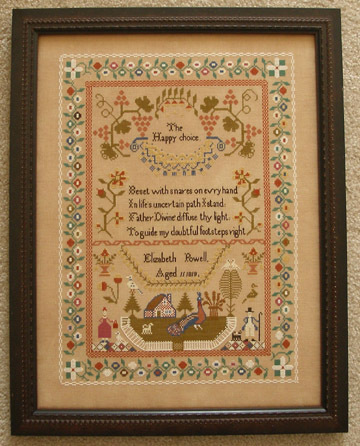 Stitched in Needlepoint Inc. silk. Stitch count = 345 high x 277 wide. Design area: 17.25” high x 13.85” wide. 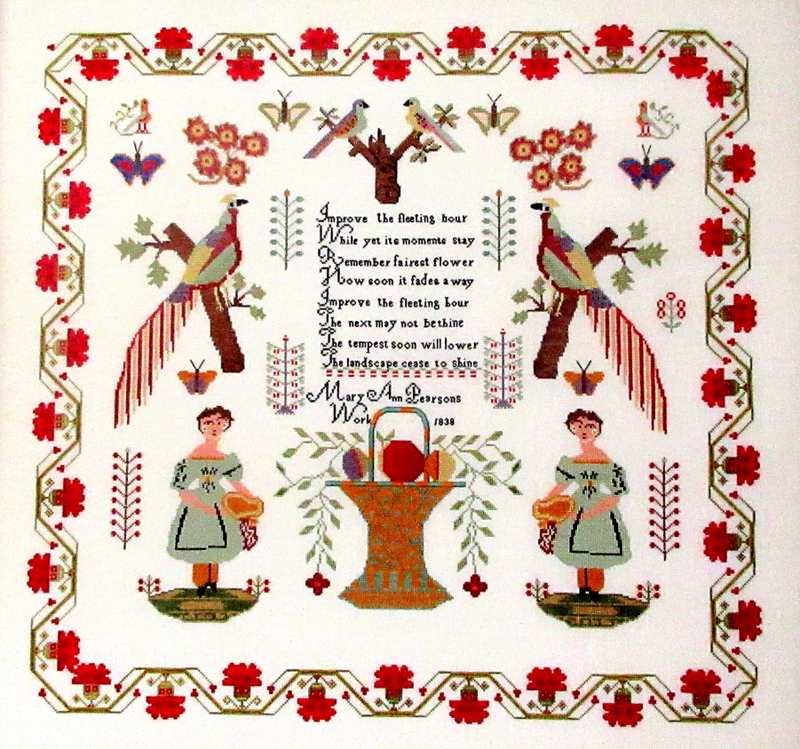 A true reproduction sampler from the QSD sampler collection. 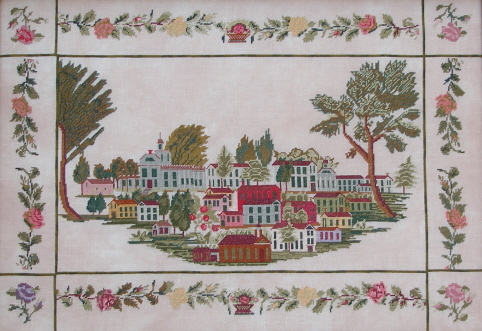 An accurate reproduction sampler of Accomack, VA.
An intermediate sampler lover should enjoy finishing this piece. 32 count Lakeside Linens color - Examplar. 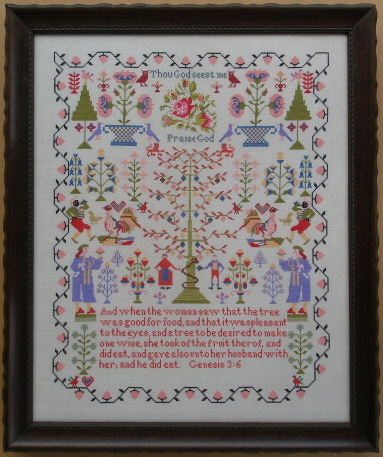 Stitched in Needlepoint Inc. silk. 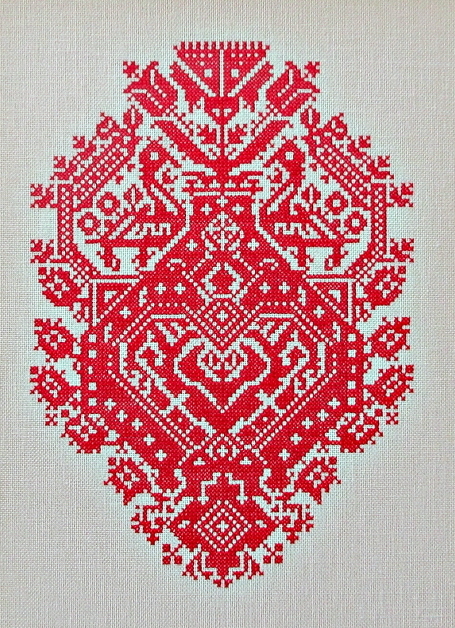 Stitch count = 379 stitches high, 230 stitches wide. Design area: 23.69” inches high by 15.06” wide. 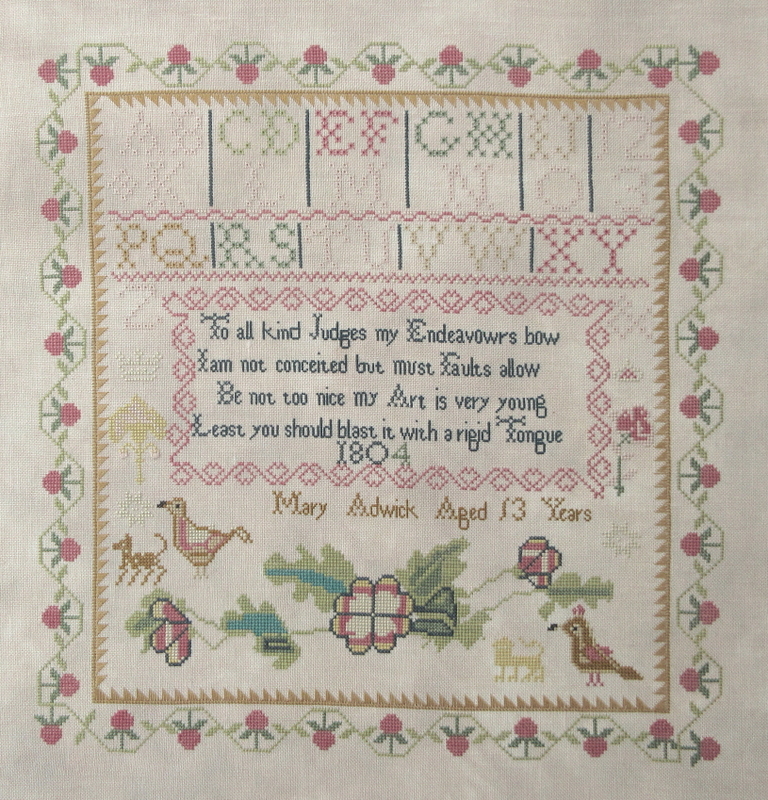 A true reproduction English sampler from the QSD collection. 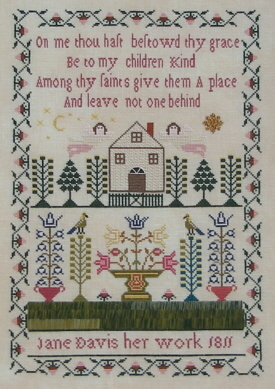 Originally published in Sampler and Antique Needlework Quarterly. 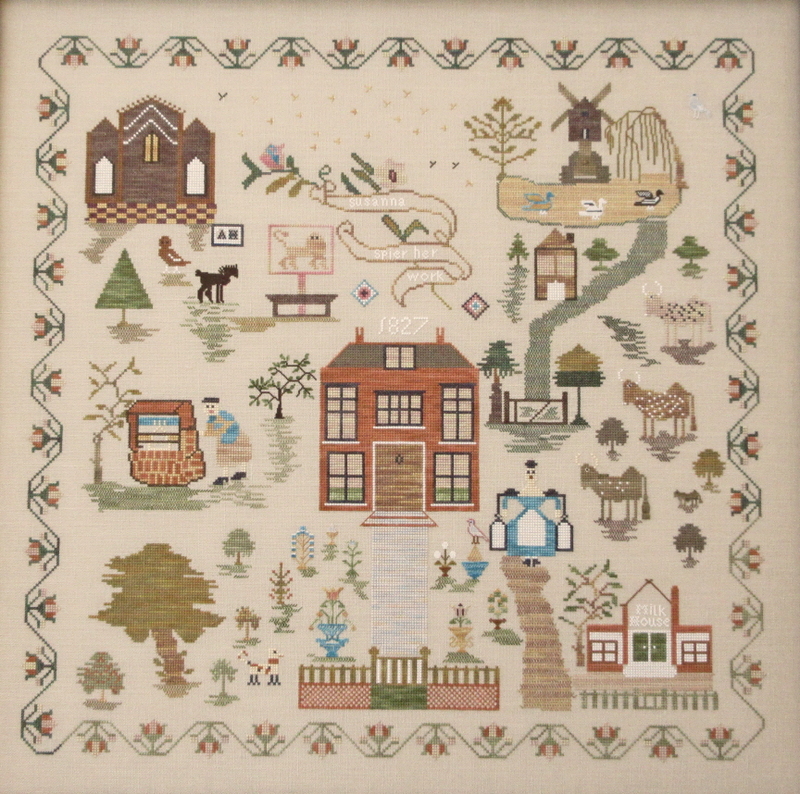 A beginning level sampler lover should enjoy completing this piece. 36 Count Lakeside Linens, Color Vintage Meadow Rue. Stitch count = 275 high x 200 wide. Design area: 15.27" high by 11.5” wide. 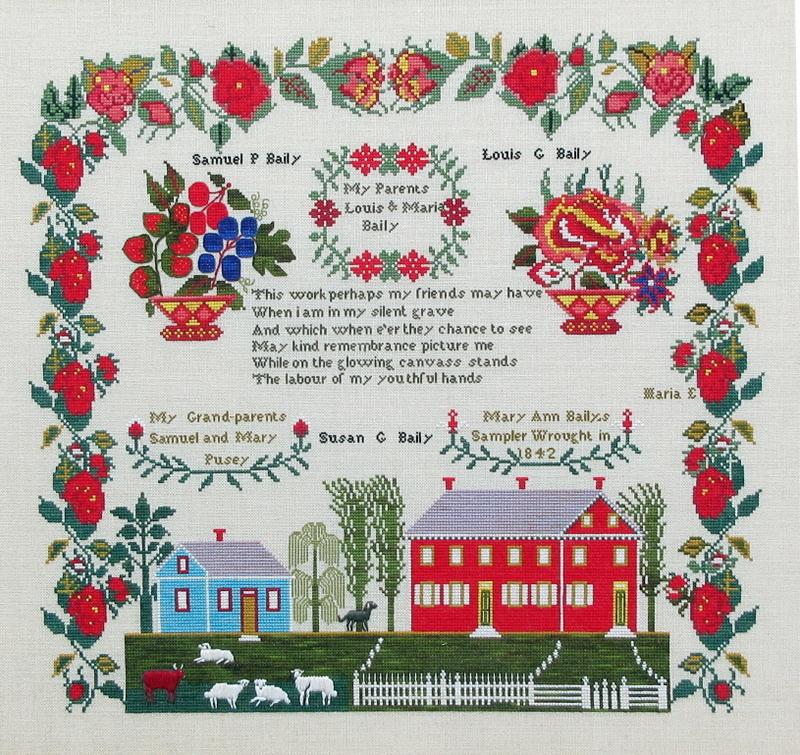 A True reproduction sampler from the QSD collection. 32 Count Lakeside Linens, color – Vintage Meadow Rue. 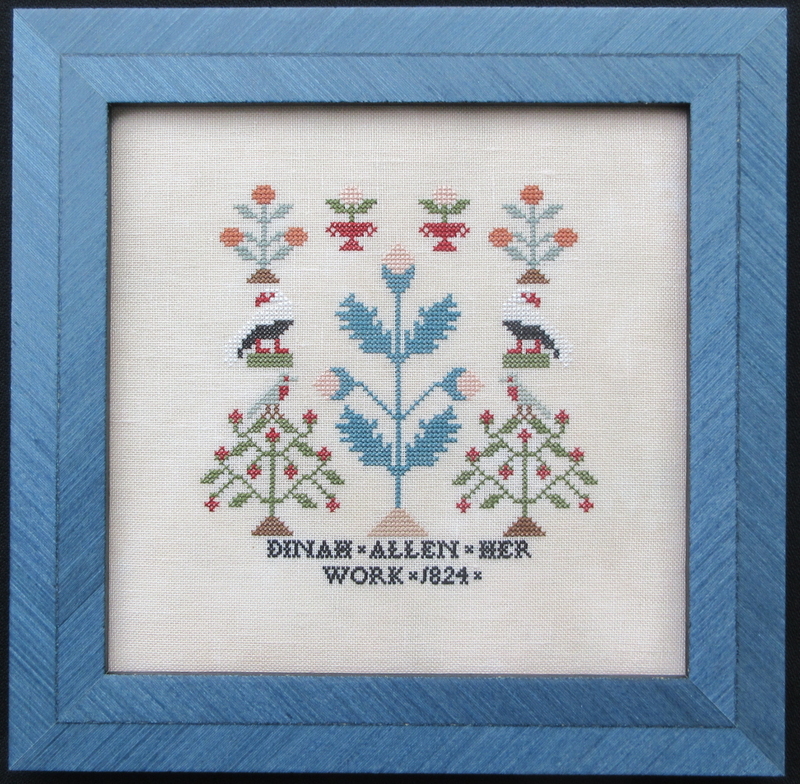 A moderate level sampler lover should enjoy completing this piece. 32 Count Lakeside Linens, Color Vintage Bisque. Stitch count = 262 high x 211 wide. Design area: 16.38" high by 13.19” wide. Stitched in DMC cotton floss. Stitch count = 154 high x 155 wide. Design area: 9.63" high by 9.69” wide. 32 Count Lakeside Linens, Color Vintage Butter Pecan. Stitch count = 229 high x 253 wide. Design area: 12.69" high by 15.13” wide. 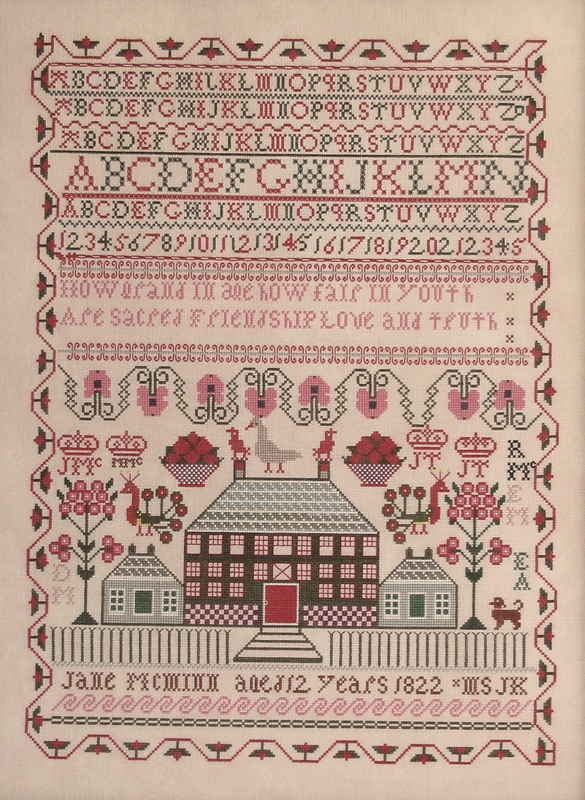 A true reproduction of a Baltimore Maryland sampler from the QSD collection. 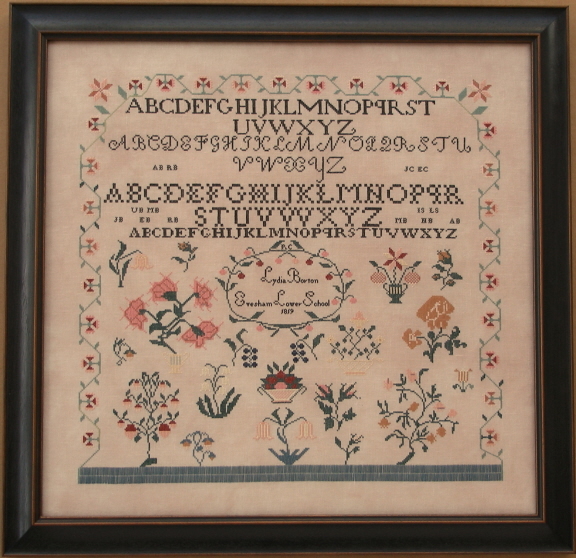 An Intermediate level sampler lover should enjoy completing this piece. 32 Count Lakeside Linens, Color Examplar. An Advanced level sampler lover should enjoy completing this piece. 40 Count Lakeside Linens, Color Light Examplar. Stitch count = 290 high x 262 wide. Design area: 21.8" high by 19.7” wide. 45 Count Lakeside Linens, Color Light Examplar. Stitch count = 415 high x 310 wide. 32 Count Lakeside Linens, Color Vintage Examplar. Stitch count = 200 high x 135 wide. 32 Count Lakeside Linens, Color Light Vintage Examplar. Stitch count = 296 high x 301 wide. 28 Count Lakeside Linens, Color Vintage Examplar. Stitch count = 195 high x 182 wide. 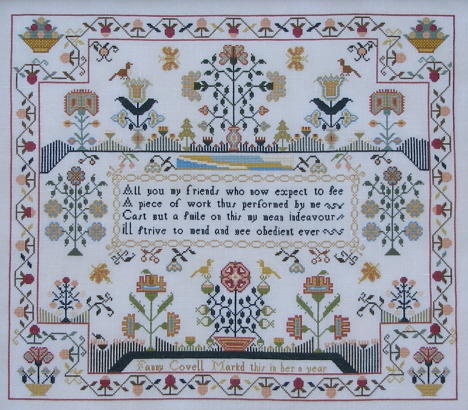 An adaptation of a sampler held in a private collection. 36 Count Lakeside Linens, Color Pearled Barley. Stitch count = 334 high x 271 wide. 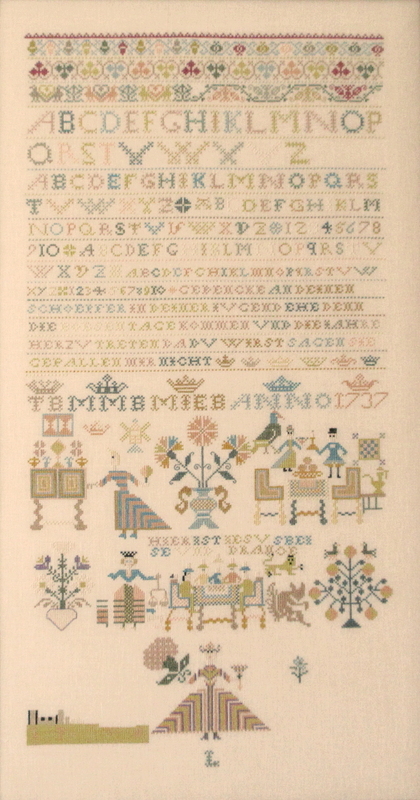 An accurate reproduction of a Colombian sampler held in the QSD collection. Any level sampler lover should enjoy completing this piece. 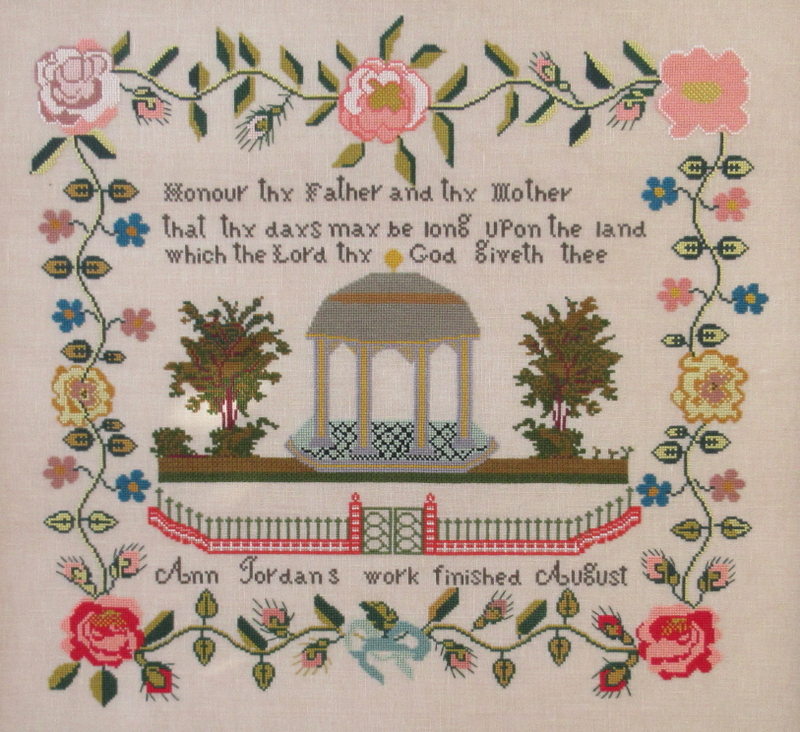 Stitched in The Gentle Arts and DMC cotton floss. Stitch count = 306 high x 314 wide. Design area: 19.13" high by 19.62” wide. 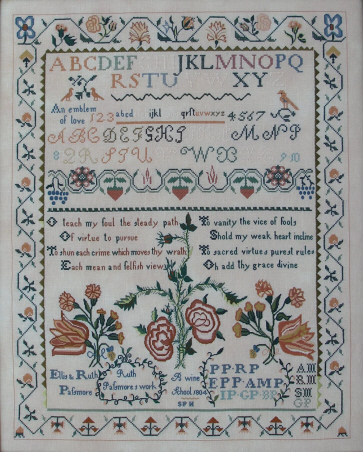 An accurate reproduction of an English sampler held in the QSD collection. 32 Count Lakeside Linens, Color Vintage Light Examplar. Stitch count = 119 high x 118 wide. Design area: 7.44" high by 7.38” wide. 40 Count Lakeside Linens, Color Vintage Luna. Stitch count = 237 high x 157 wide. Design area: 11.85" high by 7.85” wide. 40 Count Lakeside Linens, Color Vintage Bisque. Design area: 13.35" high by 15.90” wide. 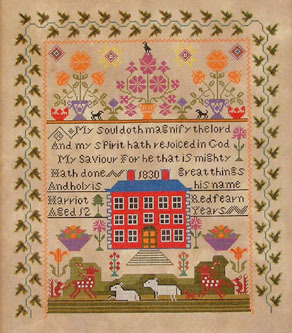 An adaptation of a c.1850 sampler held in a private collection. 40 Count Lakeside Linens, Color Vintage Light Examplar. Stitch count = 269 high x 397 wide. 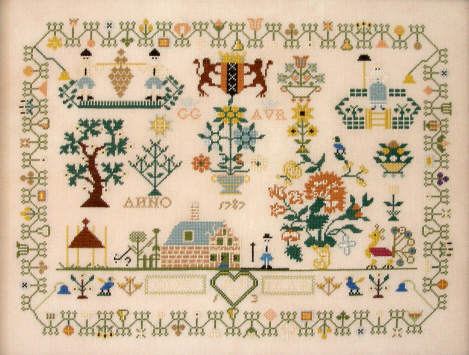 An accurate reproduction of an Amsterdam, Netherlands sampler held in the QSD collection. 40 Count Lakeside Linens, Color Vintage Porcelain. Stitch count = 216 high x 289 wide. Design area: 10.8" high by 14.45” wide. 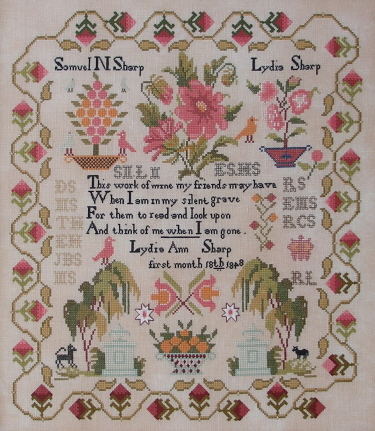 A true reproduction English sampler from Burlington Co. New Jersey. Stitch count = 277 high x 199 wide. Design area: 14.19" high by 12.44” wide. 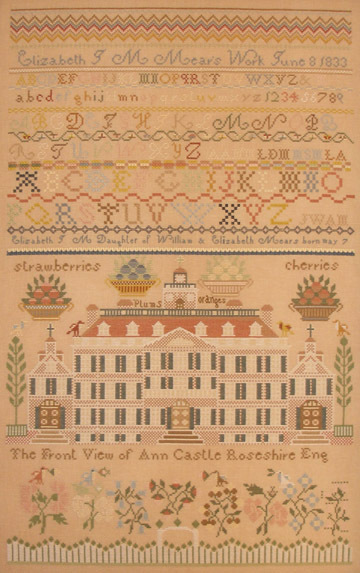 A reproduction sampler of a Brandywine School Wilmington, DE and held in the QSD collection. 32 Count Lakeside Linens, Color Vintage Luna. Stitch count = 329 high x 262 wide. The chart pack contains a more detailed and updated history than previously published. 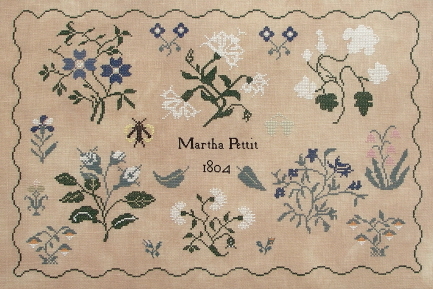 An accurate reproduction of a Chester County, Pennsylvania sampler. Stitch count = 173 high x 261 wide. Design area: 10.81" high by 16.31” wide. 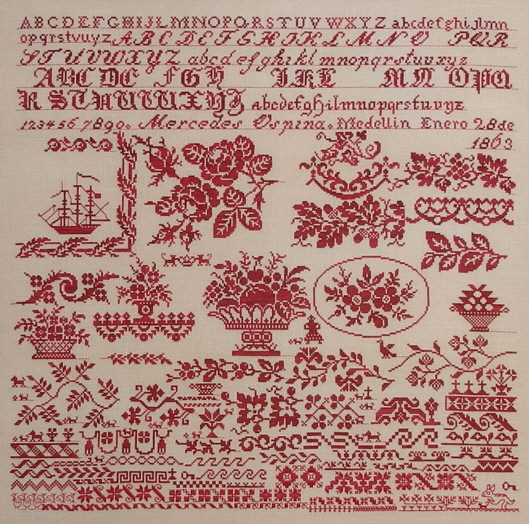 An accurate reproduction of a sampler held in a private collection. 36 Count Lakeside Linens, Color Vintage Examplar. Stitch count = 142 high x 127 wide. Design area: 7.05" high by 7.89” wide. 32 count Lakeside Linens, color - Examplar. 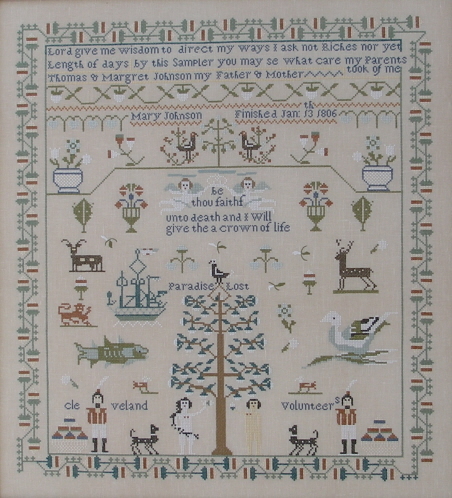 An accurate reproduction of a Norfolk England sampler held in the Queenstown Sampler Collection. 40 count New Castle linen, color - Antique White. Stitch count = 247 high x 211 wide. Design area 13.72" high x 11.72" wide. An accurate reproduction of a Tappan N.Y./N.J. 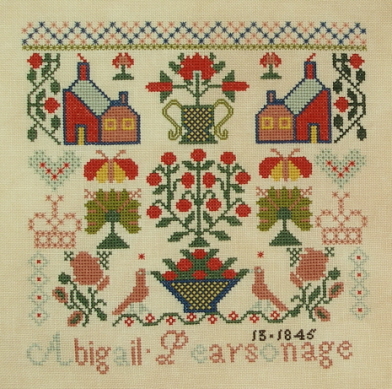 area sampler held in a private collection. 28 Count Wichelt linen, color – Amber / Toasted Almond. 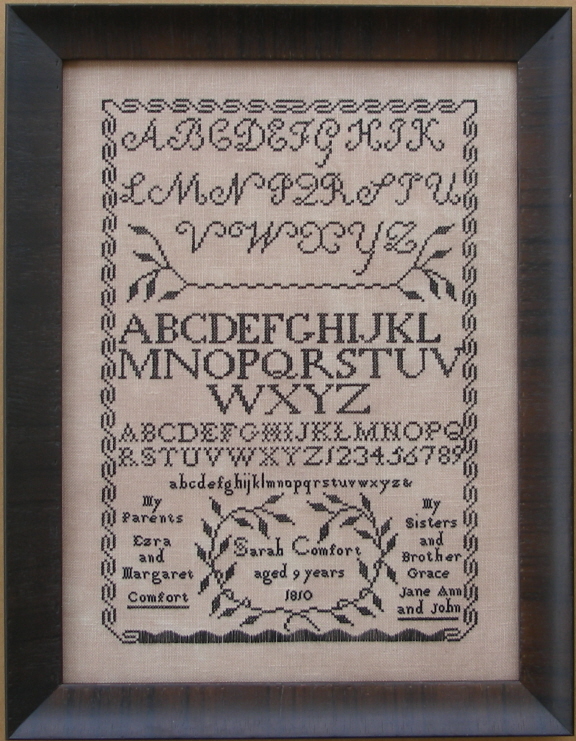 An accurate reproduction of a New York sampler held in the QSD Collection. 36 Count Lakeside Linens, color – Vintage Examplar. Design area: 13.05" high x 15.16" wide. 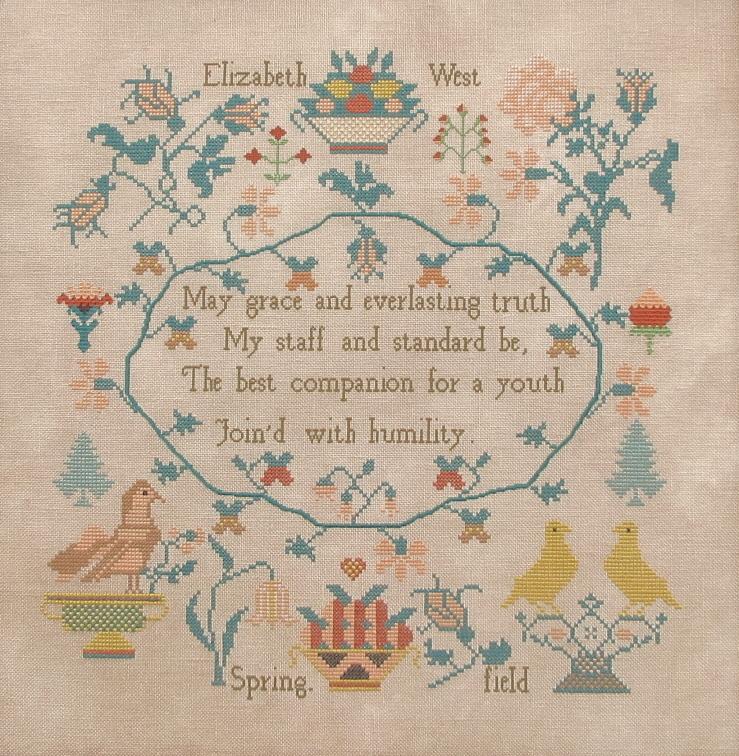 An accurate reproduction of an original English sampler held in the QSD Collection. 40 count Lakeside Linens, color - Vintage Bisque. 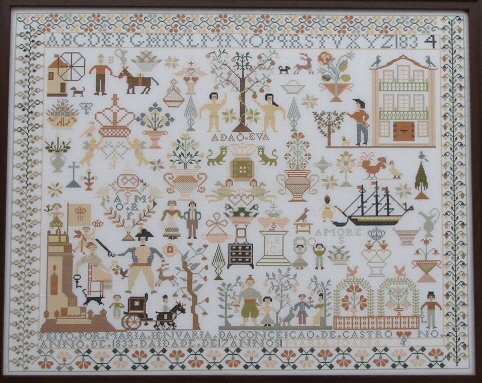 An accurate reproduction of a Portuguese sampler held in the QSD Collection. Design area: 5.43” high x 5.31" wide. 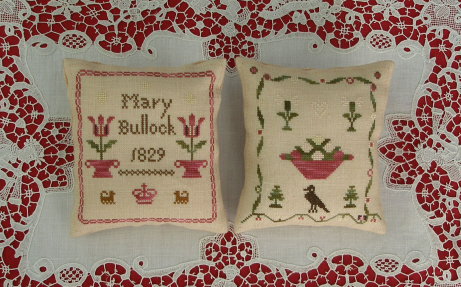 Stitched in Needlepoint Inc. silk floss. Stitch count = 291 high x 220 wide. Design area 16.17"high x 12.22" wide. Stitch count = 337 high x 249 wide. Design area: 16.85” high x 12.45” wide. Stitch count = 160 high x 240 wide. Design area: 10.00” high x 15.00” wide. Stitch count = 285 high x 291 wide. Design area: 15.83” high x 16.17” wide. Design area: 13.81” high x 13.31” wide. Design area: 10.78” high x 23.09” wide. Design area = 14.31” high x 15.94wide. 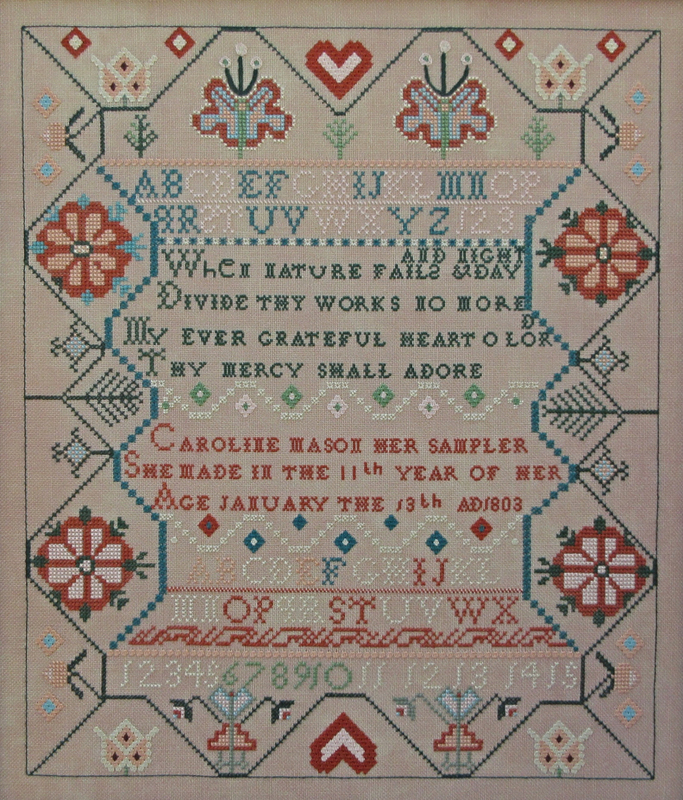 Reproduction of a Quaker sampler from Springfield, Delaware County, Pennsylvania, held in the QSD collection.